In July 1941, Smolensk fell to Germany's Army Group Center. The Germans were already two thirds of the way to Moscow. German Field Marshal von Bock was thinking he would be the one who would be the conqueror of Moscow. The only problem was that Hitler wasn't really interested in capturing Moscow, and Stalin might have something to say about it also. 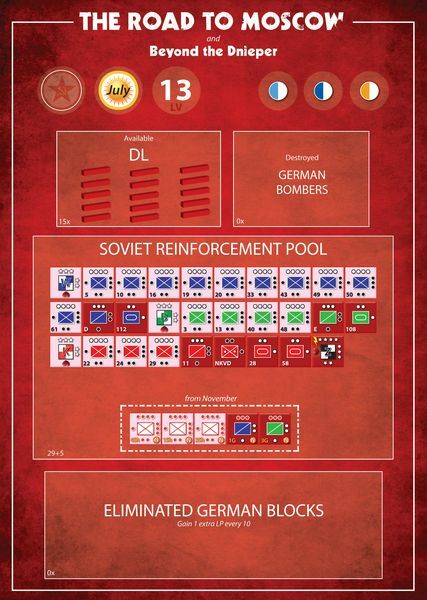 The game is a two player game (it also plays well in solitaire) about the second half of Operation Barbarossa. 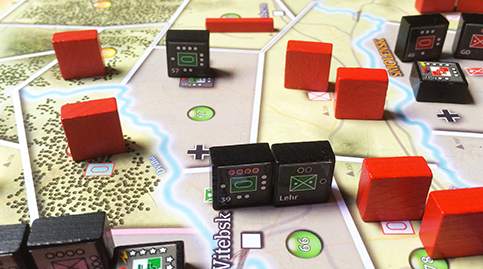 One player commands the Soviets in their desperate attempt to, if not stop, at least slow the German advance. 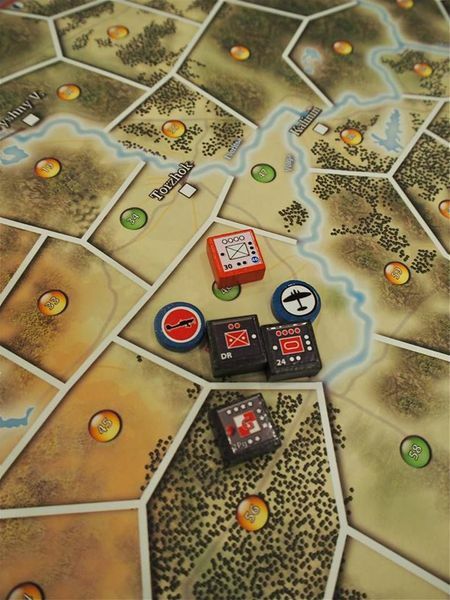 The other player takes over the German troops trying to finish the Russian Campaign before the Russian allies 'Generals Mud and Winter' can come to their aid. 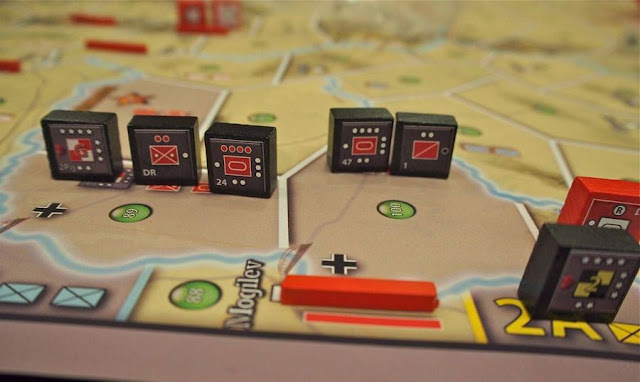 The first game I reviewed for Vento Nuovo Games was 'Bloody Monday' about another invasion of Russia one hundred and twenty-nine years earlier. 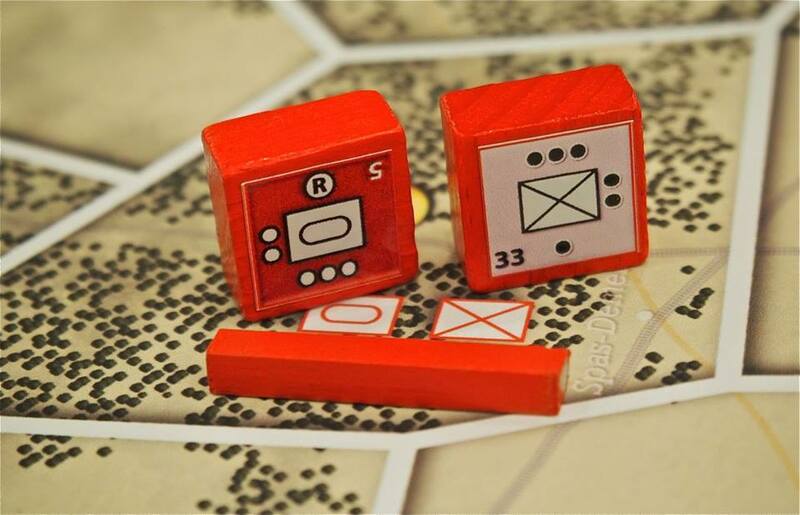 Like the other game, Moscow 41 is a block wargame. In this game you get to fight over the same exact places, along with others, that were fought over in 1812. The Russian player has to trade blood and mileage to slow the German juggernaut. 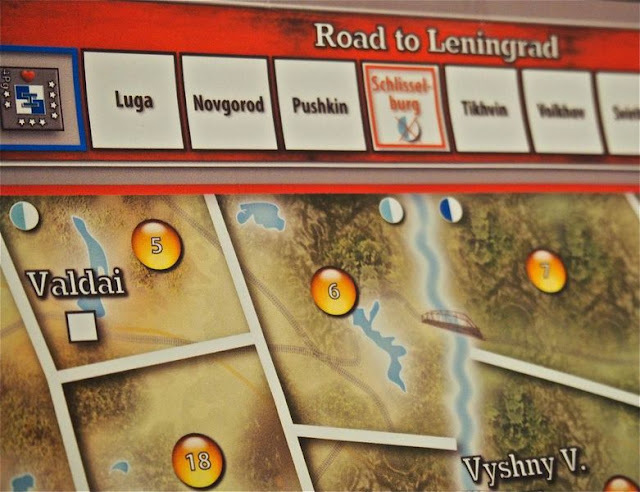 The German player also has to worry about the campaigns to the North and South of him, as the other two German Army Groups try to take Leningrad and Kiev. So the German player does not act in a vacuum. As it was historically, Hitler's obsession with Kiev and Leningrad made Army group Center's job much harder, if not impossible, before the weather interfered. Extra Blocks and stickers etc. The scale of the game is 1cm of the map equals 10km. The game turns represent one month. Besides the unit blocks there are also 'defensive lines' that are represented by rectangular blocks. There are two ways to win the campaign scenario. A 'Sudden Death' victory is if either player has seven victory points. There are five 'victory areas' (Smolensk, Tula, Orel, Voronezh, and Moscow), and two victory boxes Leningrad, and Kiev. The other scenarios have you either taking or keeping Moscow or two other locations on the map to decide victory. The Logistics Phase can only be performed at the beginning of turn two ( there is no Logistics Phase on the first turn). You can either choose to activate your leader (Hitler or Stalin), or declare a Logistics Phase. The replacement and losses on the block units are done by the usual method of turning the blocks themselves clockwise or counter-clockwise to the appropriate strength on the block. The rulebook is only nineteen pages long, without the scenario information. It is in full color and large type. The player without the initiative disk is the first to setup his units at game start, but he is the first to decide what to do in the Logistics Phase starting on turn two. The player who has the initiative disk plays the first impulse of the turn. The player with the initiative disk can also decide if he wants to play a Strategic Impulse; this would include calling for reinforcements etc. There are also rules covering artillery fire, isolation, and Soviet anti-aircraft fire. The games rules are easy to understand and the player quickly becomes used to the sequence of play. With the shorter rules and the game being so visually appealing, you might think that you have bought 'Russian Front Lite'. In this you would be very mistaken. The game is actually very deep, and puts the player into the generals' historic shoes. The game attempts, and succeeds, in making almost every choice of the player a nail-biter. 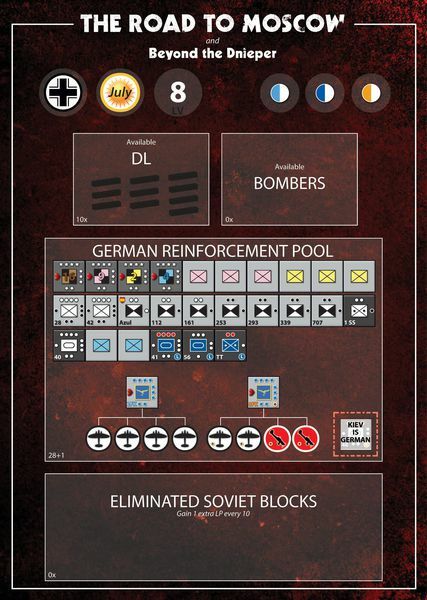 As the German, do you go full bore and hope your logistics hold? As the Soviet, in the beginning of the game you can really only react to the Germans. In the latter part of the game the Russian player has more options. 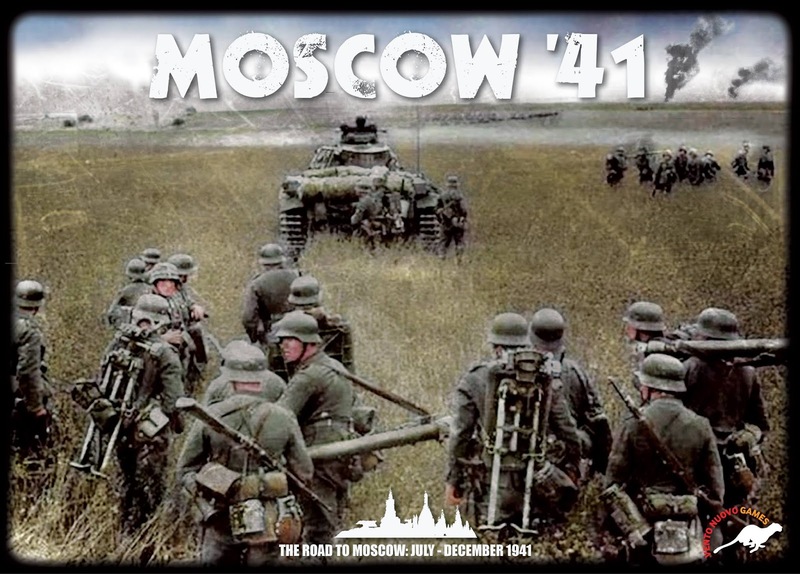 The one word I have seen consistently in write ups about Moscow 41 is 'elegant'. I could not agree more. Vento Nuovo Games are not only made to high standards, but the rules are also very well done. I am really looking forward to reviewing 'Stalingrad Inferno on the Volga'.